What’s Important About a Camp Experience! As I write, leaves are falling and the beauty of camp captivates my attention pulling me outside to the clean crisp air and all things natural. The fall season brings back reality after weeks of wishing that camp went on through the warm months of Sept. and early Oct. We had a wonderful summer and we’re looking ahead to 2018 with great anticipation. A boys shower/bathroom facility is being added on to the Brookside Shelter bathrooms. It was your turn fellas, after the girls got an upgrade several years ago. When we constructed the new dining room we lost some staff housing, so right down Brookside Avenue, from the new boy’s facility, will be a new building to hold some of our leadership and activity staff. There’s also talk of a new camper cabin and we’re still deciding where to locate that. After camp this year Anne and I ventured to the Yukon for a 12 day canoe trip down the Beaver River. We went with 9 other friends, some from Brevard and others from near and far. An old acquaintance named Mike Fischesser, organized and researched the trip and we got to reap the fruits of his interest in that area. 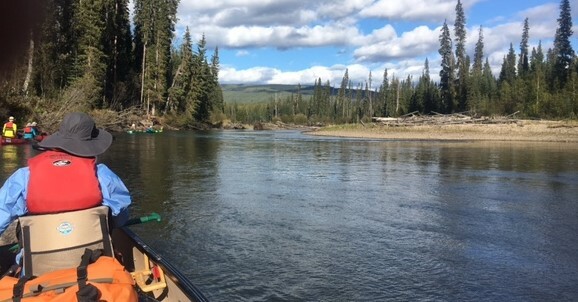 No one going on the trip had ever paddled the Beaver, but Mike did have some fairly detailed notes from a fishing/hunting guide who had been down the river 10 years earlier. We flew into Whitehorse and after a day and a half of prep (food, gear, boats and forming our team), we drove 5 hours to Watson Lake. That same day we took an hour long float plane into Toobally Lakes and then a 20 minute helicopter ride to the river put-in. Needless to say the next 12 days and 130 miles of paddling and camping were filled with adventure, fishing, hot springs, several challenging rapids, many animal sightings, beautiful scenery, and the joy of friendships and good times together sharing food and each day’s journey. For 12 days we saw no other humans, brilliant stars, the northern lights and not so much as a jet trail in the sky. I could go on to describe so many parts of that trip that stand out, but what was really poignant was the relationship building among the participants and being so close to the natural world each and every moment we were out there. I reaffirmed my convictions of how being out in nature really brings us back to the simple joys of our lives, much as it does here at camp during the summer. I for one, must have this connection for my own soul to be free from the everyday 24/7 world of screens, automobiles, and all the things that distract us and make our lives move too quickly. As mentioned above, our connection to each other is equally important and that too is so true here at camp. First on our list with our campers is making sure they are adjusting to their new community, cabin, program and table group. It’s all about meeting new people and being able to live, work and play together where no one is at the center but everyone plays a vital role. Camp plain and simple is good for us, me included. I also want to share an article that was sent to me by one our camp dads. It’s a piece that wholeheartedly embraces the benefits of camp for children. I can certainly attest there’s no perfect way to raise our children. Camp is different for different people, but I do think a camp experience and specifically a Gwynn Valley experience is very positive for those children who attend. I hope you enjoy this parent’s opinion of the camp experience. Stay tuned! Overnight summer camps are better for your kids than SAT prep classes. “Do you even like your children?” the woman I had just met asked me. The audacity of the question took my breath away. I had been chatting with her, explaining that my kids go to sleep-away camp for two months every year. I quickly realized two things at once: she was obnoxious, and she actually didn’t care if I missed my kids during the summer. She was talking about something else. I didn’t have to tell her the reason I “send them away” for most of the summer is because I like them. They adore camp, and it’s actually harder on me than it is on them. I often tell people that the first year they were both gone, it felt like I had lost an arm. I wandered around the house from room to room experiencing phantom limb pain. Now, instead of being offended, I got excited. I was going to be able to tell her something that my husband and I rarely get to explain: we do it because we truly think it will help our kids be successful in life. With underemployment and a stagnating labor market looming in their future, an all-around, sleep-away summer camp is one of the best competitive advantages we can give our children. Huh? Surely, college admissions officers aren’t going to be impressed with killer friendship bracelets or knowing all the words to the never-ending camp song “Charlie on the M.T.A.” Who cares if they can pitch a tent or build a fire? Indeed, every summer, my kids “miss out” on the specialized, résumé-building summers that their peers have. Their friends go to one-sport summer camps and take summer school to skip ahead in math. Older peers go to SAT/ACT prep classes. One kid worked in his dad’s business as an intern, while another enrolled in a summer program that helped him write all his college essays. Many (this woman included) would say that I’m doing my children a serious disservice by choosing a quaint and out-of-date ideal instead. There are online “Ivy League Coaches” that might say we are making a terrible mistake. We don’t think this is a mistake at all. It might not be something to put on the college application (unless my child eventually becomes a counsellor), but that isn’t the goal for us. Our goal is bigger. Developing broadly as a human being. MIT’s Erik Brynjolfsson says in his book The Second Machine Age that we have reached a pivotal moment where technology is replacing skills and people at an accelerated pace. He argues that creativity and innovation are becoming competitive advantages in the race against artificial intelligence, because creativity is something a machine has a hard time replicating. The problem is that creativity seems so intangible. Steve Jobs once said, “Creativity is just connecting things.” He believed that people invent when they connect the dots between the experiences they’ve had. To do this, he argued, we need to have more experiences and spend more time thinking about those experiences. Indeed. Two times more likely to play an instrument, compose or conduct. Seven times more likely to draw, paint or sculpt. Seven-and-a-half times more likely to do woodwork or be a mechanic, electrician or glass-blower. Twelve times more likely to write poetry, plays, novels or short stories. And 22 times more likely to be an amateur actor, dancer or magician. You read that right. Magician! It’s not just that this kind of original thinker actively seeks out creative pursuits. These original experiences provide a new way of looking at the world, which helped the prizewinners think differently in their day jobs. The beauty of summer camp is that not only do kids get to do all sorts of crazy new things, they also get to do it in nature, which lends its own creative boost. Most importantly, my kids have such intensely packed schedules full of sports, music, art classes, community service and technological stimulation throughout the school year that it makes finding these all-important quiet mental spaces more difficult. Summers provide a much-needed opportunity for my children to unplug, achieve focus and develop those creative thought processes and connections. OK, OK. Creativity might be a compelling tool to beat out that neighbor girl applying to the same college, but what about this “developing broadly as a human being” stuff? I didn’t come up with that phrase. Harvard did. William Fitzsimmons, dean of admissions at Harvard, has penned a compelling letter to parents. It practically begs and pleads with them to re-evaluate the summer extracurricular race and to “bring summer back,” with an “old-fashioned summer job” perhaps, or simply time to “gather strength for the school year ahead.” Fitzsimmons writes, “What can be negative is when people lose sight of the fact that it’s important to develop broadly as a human being, as opposed to being an achievement machine. In the end, people will do much better reflecting, perhaps through some down time, in the summer.” In terms of “developing broadly as a human being,” summer camp can provide an impressive list of life skills. Studies over the past decade have shown outdoor programs stimulate the development of interpersonal competencies, enhance leadership skills and have positive effects on adolescents’ sense of empowerment, self-control, independence, self-understanding, assertiveness, decision-making skills, self-esteem, leadership, academics, personality and interpersonal relations. Now for the cherry on top: independence. So, yes, Ms. Tiger Mom, I am letting my children walk out the door and make useless lanyards for two months. They might not have anything “constructive” to place on their college application, but they will reflect, unwind, think and laugh. They will explore, perform skits they wrote themselves and make those endless friendship bracelets to tie onto the wrists of lifelong friends. The result will be that when they come back through our door, we’re pretty sure that, in addition to having gobs of creativity and independence, they’ll be more comfortable with who they are as people. https://gwynnvalley.com/wp-content/uploads/2017/10/Yukon-1-cropped.jpg 302 578 Grant Bullard Grant Bullard2017-10-20 11:22:272018-03-02 15:26:20What's Important About a Camp Experience!